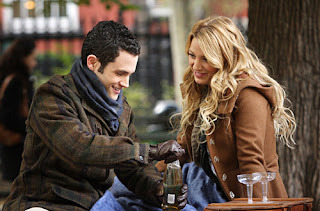 Now for a Gossip Girl post! Honestly, I love the outfit Serena (Blake Lively) has on here. Bitterbabe(Koko Stiletto) displayed one way of wearing the school uniform and here's another. I love the jacket so much here, not so much the gloves, I think they are a thad to bright. The sweater she's using on the inside looks good overall with the light brown jacket. Yes, I think the bag is pretty cool and I'm jealous of their school uniform. Courtesy Of Gossip Girl and Gossip Girl Fan. Now for Dan's (Penn Badgley) outfit. I love how he looks here, I don't usually notice his clothes that much. However, I found this outfit really nice for guys. The jacket looks really good, and the scarf matches and I should mention the leather gloves because it looks awesome with the outfit. Overall the whole outfit seem to have fallen in place. I love the fashions from that show, whoever is styling it, is doing a great job!! Gah, yes Serena's jacket is beautiful. I want it! Funny thing is, I always notice male outfits because I like boys who dress well :) Throughout the season, I thought Chuck's style was the best, but now I'm beginning to like Dan's too. Bitterbabe: No worries (: I agree Chuck has some pretty crazy outfits on the show. Jen: Thanks for viewing my blog! I think the stylist for the show is awesome! I think every designer wants their clothes to get featured. LOL. Shredz: YES, her jacket is just WOW. I do notice male outfits, but not so much Dan's. I love Nate, just because I think he is hot. HAHA. feel free to drop me a line sometime- have a good day! Lovemeknot: Thanks for dropping by my blog (: I see you're into handmade creations, nice nice.